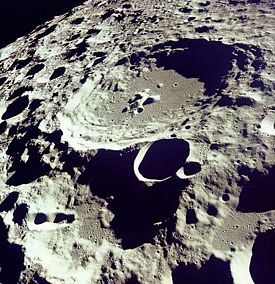 Lunar astronomy: the large crater is Daedalus, photographed by the crew of Apollo 11 as they circled the Moon in 1969. Located near the center of the far side of Earth's Moon, its diameter is about 58 miles (93 km). Astronomy (Greek: αστρονομία = άστρον + νόμος, astronomia = astron + nomos, literally, "law of the stars") is the science of celestial phenomena that originate outside Earth's atmosphere. It gives us the context for our existence in an evolving universe of untold numbers of galaxies and complex structures at all scales. It studies the origins, evolution, and physical and chemical properties of celestial objects. In short, astronomy is about finding out what is going on beyond Earth. Astronomy is one of the oldest sciences, with a scientific methodology existing at the time of Ancient Greece and advanced observation techniques possibly much earlier as seen in the study of archaeoastronomy. In ancient cultures astronomical observations were often connected to religious thought, a remnant of which we find in astrology today. The earliest observations of the heavens were by naked eye, but even this method allows the celestial objects to be cataloged and assigned to constellations. A knowledge of the constellations has been an important navigational tool since the earliest times. The emergence of astronomy as a science following the scientific method is very important to the development of science in general. It was through astronomy with the development of the heliocentric (sun-centered) view of the solar system that we find the early seeds of conflict between Christian thought and science (see Galileo Galilei). Astronomy is one of the few sciences where amateurs can still play an active role, especially in the discovery and monitoring of transient phenomena. In ancient Greece and other early civilizations, astronomy consisted largely of astrometry, measuring positions of stars and planets in the sky. Later, the work of Johannes Kepler and Isaac Newton, whose work led to the development of celestial mechanics, mathematically predicting the motions of celestial bodies interacting under gravity, and solar system objects in particular. Much of the effort in these two areas—once done largely by hand—is highly automated nowadays, to the extent that they are rarely considered as independent disciplines anymore. Motions and positions of objects are now more easily determined, and modern astronomy is more concerned with observing and understanding the actual physical nature of celestial objects. Since the twentieth century, the field of professional astronomy has split into observational astronomy and theoretical astrophysics. Although most astronomers incorporate elements of both into their research, because of the different skills involved, most professional astronomers tend to specialize in one or the other. Observational astronomy is concerned mostly with acquiring data, which involves building and maintaining instruments and processing the resulting information; this branch is at times referred to as "astrometry" or simply as "astronomy." Theoretical astrophysics is concerned mainly with ascertaining the observational implications of different models, and involves working with computer or analytic models. The fields of study can also be categorized in other ways. Categorization by the region of space under study (for example, Galactic astronomy, Planetary Sciences); by subject, such as star formation or cosmology; or by the method used for obtaining information. Planetary astronomy, or Planetary Sciences: a dust devil on Mars. Photographed by Mars Global Surveyor, the long dark streak is formed by a moving swirling column of Martian atmosphere (with similarities to a terrestrial tornado). The dust devil itself (the black spot) is climbing the crater wall. The streaks on the right are sand dunes on the crater floor. Astrometry: the study of the position of objects in the sky and their changes of position. Defines the system of coordinates used and the kinematics of objects in our galaxy. Astrophysics: the study of physics of the universe, including the physical properties (luminosity, density, temperature, chemical composition) of astronomical objects. Cosmology: the study of the origin of the universe and its evolution. The study of cosmology is theoretical astrophysics at its largest scale. Galaxy formation and evolution: the study of the formation of the galaxies, and their evolution. Galactic astronomy: the study of the structure and components of our galaxy and of other galaxies. Extragalactic astronomy: the study of objects (mainly galaxies) outside our galaxy. Stellar astronomy: the study of the stars. Stellar evolution: the study of the evolution of stars from their formation to their end as a stellar remnant. Star formation: the study of the condition and processes that led to the formation of stars in the interior of gas clouds, and the process of formation itself. Planetary Sciences: the study of the planets of the Solar System. Astrobiology: the study of the advent and evolution of biological systems in the Universe. In astronomy, information is mainly received from the detection and analysis of electromagnetic radiation and photons, but information is also carried by cosmic rays, neutrinos, meteors, and, in the near future, gravitational waves (see LIGO and LISA). Optical astronomy is the part of astronomy that uses specialized equipment to detect and analyze light in and slightly around the wavelengths that can be detected with the eyes (about 400 - 800 nm). The most common tool is the telescope, with electronic imagers and spectrographs. Infrared astronomy deals with the detection and analysis of infrared radiation (wavelengths longer than red light). The most common tool is the telescope but with the instrument optimized for infrared. Space telescopes are also used to eliminate noise (electromagnetic interference) from the atmosphere. Radio astronomy detects radiation of millimeter to decameter wavelength. The receivers are similar to those used in radio broadcast transmission but much more sensitive. See also Radio telescopes. High-energy astronomy includes X-ray astronomy, gamma-ray astronomy, and extreme UV (ultraviolet) astronomy, as well as studies of neutrinos and cosmic rays. 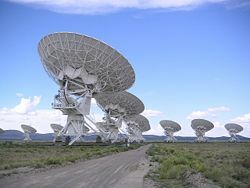 Optical and radio astronomy can be performed with ground-based observatories, because the atmosphere is transparent at the wavelengths being detected. Infrared light is heavily absorbed by water vapor, so infrared observatories have to be located in high, dry places or in space. The atmosphere is opaque at the wavelengths used by X-ray astronomy, gamma-ray astronomy, UV astronomy and (except for a few wavelength "windows") Far infrared astronomy, so observations must be carried out mostly from balloons or space observatories. Powerful gamma rays can, however be detected by the large air showers they produce, and the study of cosmic rays can also be regarded as a branch of astronomy. Extragalactic astronomy: gravitational lensing. 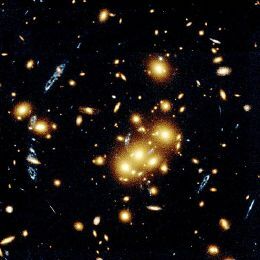 This image shows several blue, loop-shaped objects that are multiple images of the same galaxy, duplicated by the gravitational lens effect of the cluster of yellow galaxies near the photograph's center. The lens is produced by the cluster's gravitational field that bends light to magnify and distort the image of a more distant object. In early times, astronomy only comprised the observation and predictions of the motions of the naked-eye objects. Aristotle said that the Earth was the center of the Universe and everything rotated around it in orbits that were perfect circles. Aristotle had to be right because people thought that Earth had to be in the center with everything rotating around it because the wind would not scatter leaves, and birds would only fly in one direction. For a long time, people thought that Aristotle was right, but now some people think that Aristotle accidentally did more to hinder our knowledge than help it. The Rigveda refers to the 27 constellations associated with the motions of the sun and also the 12 zodiacal divisions of the sky. The ancient Greeks made important contributions to astronomy, among them the definition of the magnitude system. The Bible contains a number of statements on the position of the earth in the universe and the nature of the stars and planets, most of which are poetic rather than literal; see Biblical cosmology. In 500 C.E., Aryabhata presented a mathematical system that described the earth as spinning on its axis and considered the motions of the planets with respect to the sun. Observational astronomy was mostly stagnant in medieval Europe, but flourished in the Iranian world and other parts of Islamic realm. In the late ninth century, Persian astronomer al-Farghani wrote extensively on the motion of celestial bodies. His work was translated into Latin in the twelfth century. In the late tenth century, a huge observatory was built near Tehran, Persia (now Iran), by the Persian astronomer al-Khujandi, who observed a series of meridian transits of the Sun, which allowed him to calculate the obliquity of the ecliptic. Also in Persia, Omar Khayyám performed a reformation of the calendar that was more accurate than the Julian Calendar and came close to the Gregorian. Abraham Zacuto was responsible in the fifteenth century for the adaptations of astronomical theory for the practical needs of Portuguese caravel expeditions. During the Renaissance, Copernicus proposed a heliocentric model of the Solar System. His work was defended, expanded upon, and corrected by Galileo Galilei and Johannes Kepler. Galileo added the innovation of using telescopes to enhance his observations. Kepler was the first to devise a system that described correctly the details of the motion of the planets with the Sun at the center. However, Kepler did not succeed in formulating a theory behind the laws he wrote down. It was left to Newton's invention of celestial dynamics and his law of universal gravitation to finally explain the motions of the planets. Newton also developed the reflecting telescope. Stars were found to be faraway objects. With the advent of spectroscopy, it was proved that they were similar to our own sun but with a wide range of temperatures, masses, and sizes. The existence of our galaxy, the Milky Way, as a separate group of stars was only proven in the twentieth century, along with the existence of "external" galaxies, and soon after, the expansion of the universe, seen in the recession of most galaxies from us. Modern astronomy has also discovered many exotic objects such as quasars, pulsars, blazars and radio galaxies, and has used these observations to develop physical theories which describe some of these objects in terms of equally exotic objects such as black holes and neutron stars. Physical cosmology made huge advances during the twentieth century, with the model of the Big Bang heavily supported by the evidence provided by astronomy and physics, such as the cosmic microwave background radiation, Hubble's Law, and cosmological abundances of elements. 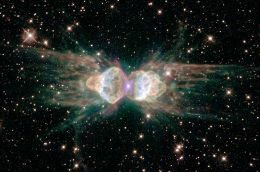 Stellar astronomy, Stellar Evolution: The Ant planetary nebula. Ejecting gas from the dying center star shows symmetrical patterns unlike the chaotic patterns of ordinary explosions. Astronomy News - Daily Astronomy provides current news and information pertaining to all areas of astronomy, plus free news feeds for webmasters. This page was last modified on 23 April 2018, at 23:05.